Nativity, traditions and music to get closer to the magic atmosphere of Christmas in a unique way. The Nativity of Peace realized by Demi art is in the Christmas market in Rovereto: the wood nativity scene was designed by master Karl Demetz, who coordinated and guided the construction work with his collaborators and sculptors. The crib is made of larch with figures in stone pine: two months of working and construction helped define precisely every detail of the sculptures in wood, creating a unique work of its kind. 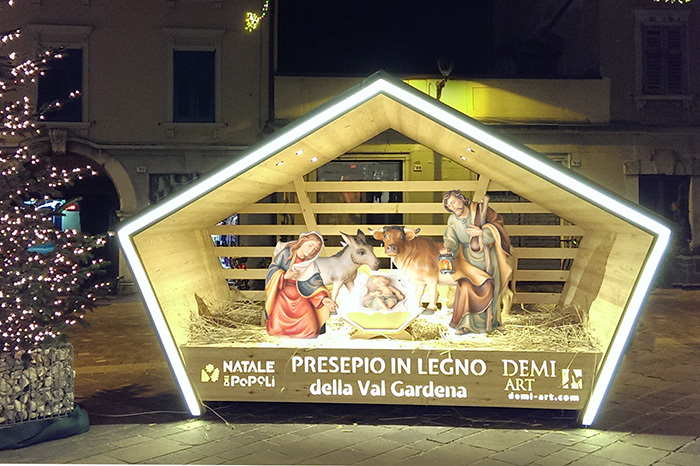 Come visit the exhibition of Demi art at the Christmas market in Rovereto, via Roma capannina nr 41: you will find many Christmas articles made in original wood by Demi Art.